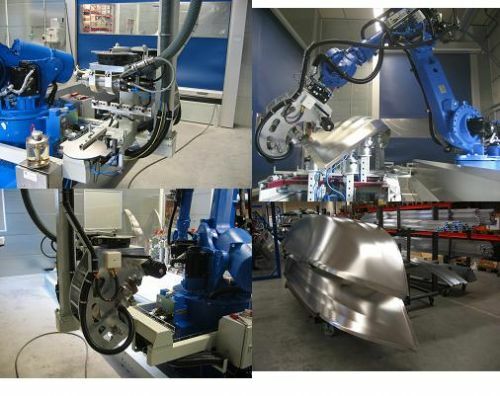 The installation consists of two adjustable fixtures (via robot) for the hold on of boat hulls, and a robot on tracks with tool changer to the three main tools: spindle motor, roll bending tool and gripping tool. The spindle motor changes between five end mills of different sizes. The operator lifts in a boat hull in the robot cell with a column mounted cranes and put the hull via the guide pins on the jig arms. Vacuum Cups holds the boat hull against the jig arms. After loading ensures the robot cell with a button and the operator goes out of the cell and start the process on control panel. The robot switches to the spindle motor and mill out the correct form of the hull and does various holes for boat interiors. After milling, the robot switches to the roll bending tool for bending both of the stern and the keel. Meanwhile, the operator loads the second robot cell. When the robot is finished, it automatically goes to the second cell and begin processing.